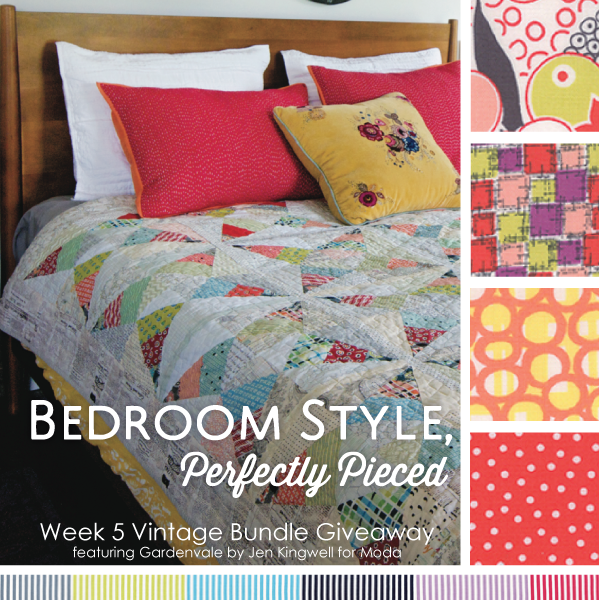 Vintage Retro Fabric Bundle – This week’s GIVEAWAY! Is your style Vintage Retro? Do you love combing thrift shops for relics of times gone by? Do you adore florals, and polka dots, and sorbet colored furniture? Are your walls decorated in tin signs and posters declaring allegiance to brands that no longer exist? Then you just might want to listen up, cause this week’s giveaway is just for you. In Bedroom Style, Vintage Retro is one of five styles that is showcased, and I talk all about how to add the little touches that will make your quilts an heirloom for years to come. We’ll walk through classic “vintage” colors and accents, what fabric styles will really make your retro quilts shine, and even how to accessorize your space so that your love of all things past is evident. You’re going to have so much fun with this book! For this week’s giveaway, I chose a beautiful bundle of Jen Kingwell’s new line, Gardenvale, from Moda fabrics. This collection features retro prints in an assortment of colors, sure to please any vintage lover. I especially love that she included black in her collection–what is more retro than sorbet colored skirts and black and white checked floors? In addition to Gardenvale, I chose several “low volume” prints for use as the background. This quilt is going to be awesome. I love Vintage Retro! The one downside to living in the Southwest is the lack of those wonderful Thrift/Antique stores I used to find in New York. I miss those shops ! I love the quilt kit and the colors in Gardenvale. I’ve only recently discovered Jen Kingwell and love what I’m seeing! Love your post! Love this quilt. Vintage fabrics add so much to a quilt. Love them. This is a great look. Putting a house together on a budget over the past 13 years of marriage has required this angle of decorating. I finally got your book! I even toke pictures. Now I need to figure out how to get an instagram account. I also need to figure out how to load them on pinterest. I am so excited for your give away. Why does the master always seem to be the most neglected? I love this quilt and your book is on my wish list. What a fantastic bundle! Thanks for the chance. what a fabulous giveaway?! Thank you for the chance. I just adore Jen’s new fabric and this pattern is perfect. I love you this giveaway! !